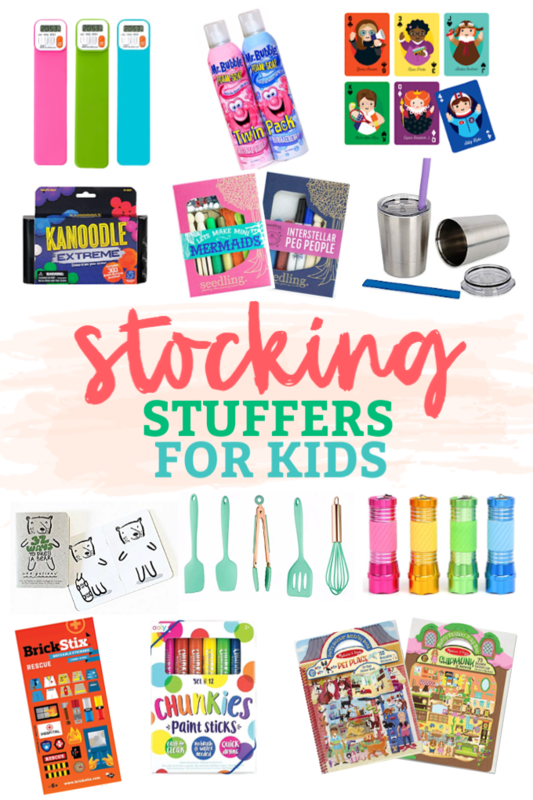 Fun Kids’ Stocking Stuffers – From creative to clever, practical to pure fun, here’s a stocking stuffer idea for every kid on your list! 1. Book Plates – It feels so fun to mark something as your own, and bookplate stickers are the perfect way to start your own little library. These cute, personalized bookplates are pretty gender neutral (and adorable). 2. A fun little flashlight. Whether they use it for exploring, telling ghost stories, or doing some reading under the covers, a little flashlight always comes in handy! 3. A Reading Timer Bookmark – I love these little timer bookmarks for a lot of reasons. 1) They’re motivating to kids who like to break records, keep streaks, or compete. 2) They’re great for tracking school reading, or working toward a reading goal 3) They’re hard to lose! I like the size and heft. I got one for each child this year! 4. 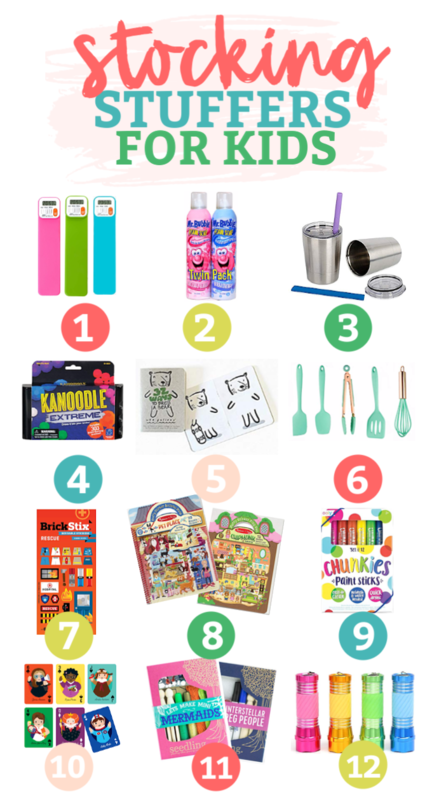 No Mess Color-Your-Own Sticker Packs – We love the Color Wonder no-mess line of products, and I recently spotted these color-your-own sticker packs at Target. (I couldn’t find them online at Target, but they were about $5) I picked them up for a car trip, and both kids LOVED them! They had lots of different sets–Paw Patrol, princess, etc. 5. 32 Ways to Dress A–. These little sketch pads are ADORABLE. Each mini book has a different animal, waiting to be “dressed.” I love the different animals! 6. 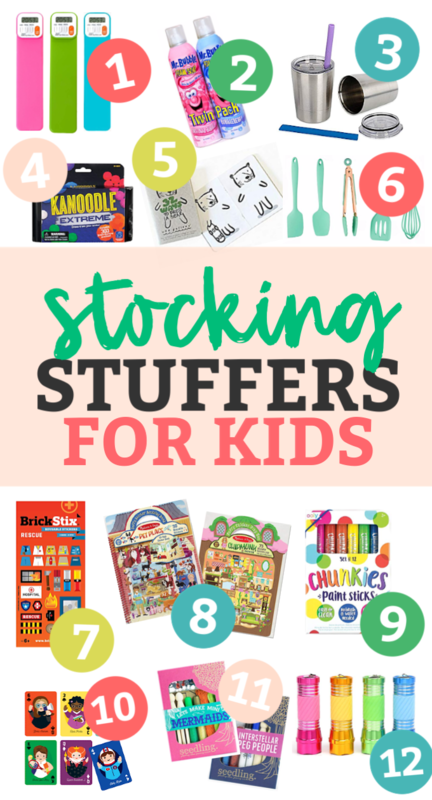 BrickStix – Fun kids’ stocking stuffers at their finest! These Brickstix are reusable stickers you can add to LEGOs! Both my LEGO lovers would dig these sticker kits, like a Rescue kit or a Home kit. 7. Puffy Sticker Books – These are our FAVORITE! The stickers get SO much use before losing their stick, even with lots and lots (and LOTS!) of repositioning. The Pet Shop and Chipmunk House have been two of our favorites. 8. Paint Sticks – These bright, bold paint sticks are less mess than any other paints I know. They dry quickly, work like markers, and clean up well! 9. Creative Cutting & Crafting – Maybe it’s a pack of play-dough tools, some fun scallop-edge scissors, or beads. Something to inspire a bit of creativity. 10. Scratch Art – Scratch art is so fun–you use your stylus or pencil to scratch off the black revealing bright colors underneath. Try this 125ct. scratch note pack or this 15 page mini spiral notebook. 11. No-Spill Bubbles. These no-spill bubbles were a favorite from our Easter baskets this year, and I LOVE that they really are no-mess! 12. Mini Cooking Utensils – If you have a little one who loves cooking with you, these kid-sized utensils are fantastic! They’re made to be used (they’re not toys), and the quality is really impressive. I’ve got a set for Sophie and I think she’s going to love them! 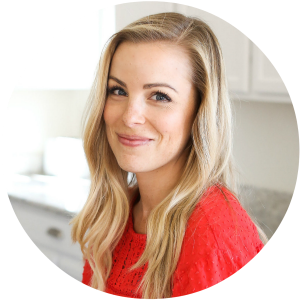 PS – Here are 20+ Easy Recipes to Make with Kids. 13 & 14. A fun pack of playing cards. After loving the Little Leaders and She Persisted books, Sophie would love this little set of inspiring women playing cards! I love the illustrations. Or, there’s this fun set of Harry Potter cards that might be perfect. PS – Prefer to include a little game? These are some of our tried-and-true favorites. 15. Bath Foam – A friend gave Milo & Sophie one of these bath foams last year and we are JUST finishing them up. Both kids LOVE THEM! Whether you use these in a bath or shower, or just pull them out for some sensory play, bath foam makes a great kids’ stocking stuffer! 17. Make Your Own kits – Seedling is the KING of “create you own” creativity kits for kids. They have a lot of cool bigger kits that would make great gifts, but for stockings, I’m totally digging these Make Your Own Mermaid and Make Your Own Astronaut kits, or this fun Make Your Own Pirate kit. So fun! 18. Reusable Cups – These reusable cups are so great for holding drinks or smoothies, especially on the go. You can use silicone reusable straws with them and they’re amazing!